Barnsley Starter Packs is affiliated to Church Action on Poverty in Barnsley. We are dedicated to helping vulnerable people on their journey out of homelessness and into settled, independent accommodation. We are staffed by volunteers and receive no statutory financial support. We rely on generous donations from members of the public who wish to help eradicate street homelessness. In these tough economic times the truth is that many of us are only ‘two pay packets away from homelessness’. Thankfully, most of us will never experience the stark reality of having no where to call home. But, for those who have lost everything, getting back on your feet takes a lot more than simply putting a roof over your head. Many properties, including those from ‘social landlords’ like Berneslai Homes are let completely unfurnished – which for someone with absolutely nothing at all can be overwhelming. The prospect of returning to an empty house, without a bed to sleep on, a kettle to make a drink – or even a cup to drink it from causes tenancies to fail, and contributes to people to becoming trapped in the ‘revolving door of homelessness’. We are committed to providing practical support to help people out of homelessness – and on with their lives. 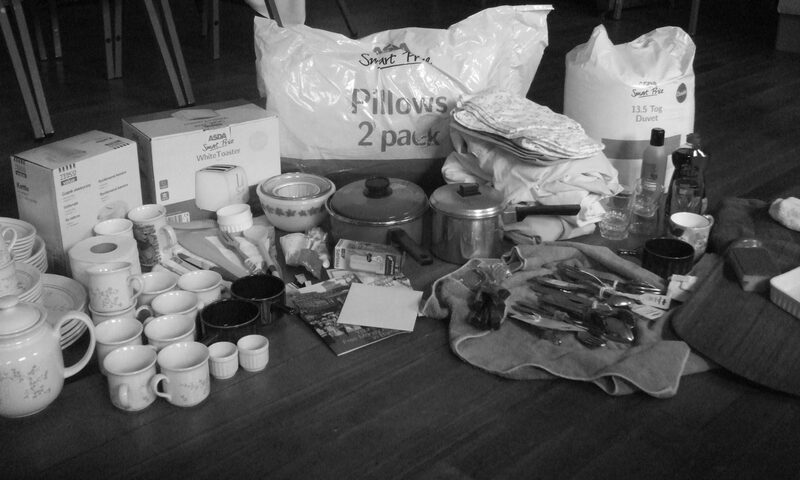 We provide a ‘Starter Pack’ of essential household items to former homeless people moving into settled accommodation. A Starter Pack contains a mix of new items, and good quality recycled items – because we are also passionate about eradicating waste! cleaning products, personal hygiene items and tea, coffee and sugar to make a hot drink. We often receive donations of curtains, bedding and towels which can be collected alongside the Starter Pack when available. We call this our ‘treats table’ and encourage referrers to collect something to make the recipients house more comfortable. Starter Packs – a hand up – not a hand out.